Are there any other Cape Dory 28 owners on this forum? Would love to strike up a friendship with a fellow Dory owner. I’m brand new to this so in need of sage advice. Hope to hear from you soon. I owned a gasser for several years. Great boat! What kinda speed did you get with a gas engine. I’ve got a Westerbeke 100hp. Not sure what rpm is going to be best for both fuel economy and speed. Hoping it’ll cruise at 8-9 knots. Here is some data I gleaned from my gasser. It shows that it takes about 40 hp to go 7 kts. It will take the same power to push it that fast with a diesel. That is probably where you want to run your Westy for a compromise between speed, fuel efficiency, engine noise, etc. I would expect that to be about 2,500 rpm on the Westy. So I don't think you will cruise at 9 kts, though you could push it to 8 kts which would require about 65 hp but that is as far as I would go. You might want to send a PM to Heron. He has a Cape Dory 28 but believe it has a Volvo. I used to have a 38. Steve I’ve been getting replies... maybe I’m not sure how to navigate this forum. Hi Fish53. So that boat in the pic and in your avatar is a Cape Dory 38 hull? Never knew they made one. Looks like a Lowell design. Thanks for the info Your boat has a real nice hull. Similar to the CD 28's - a true Downeast hull. I wonder who designed both. They are unlike the CD 36 and 40 cruisers that were twin engine and I think deep v hulls that i believe were designed by Clive Dent or someone like that. I am also familiar with the commercial CD 42 which was based on the Royall Lowell Bruno hull I believe and had a hard chine. Do you recall the beam and draft of your boat? It has many similarities to my Webbers Cove but looks to be a deeper draft. Also, did your boat roll a lot? The 28's are big little ships - for a 28 foot boat they seem to have everything you need to go anywhere. Great boats. Hi Peter, Happy New Year to you. You're right she's a Lowell design but she's not a downeast hull, she's a full displacement hull, mine drew almost six feet. Her beam was 13' 4" and she weighed 50,000+ lbs. She did roll as would be expected with a round bilge but not too bad, I had pravanes but took them off as I didn't mind the roll and they collected lobster gear quite fast. I have to say she was one hell of a good seaboat, I used to lay in some pretty snotty weather waiting for it to moderate so I could set the gear again and never felt concerned. Sounds like the definition of a tank. Good luck with the Webco project. They didn't skimp on the layup from what i have seen. As a former sailor anything 6knts and up is fast. Hi Jim, Just a follow up on this. I am curious to learn more about your USCG boat. I had a USCG Plastic 30 for a while and got a book on the USCG patrol fleet from 1924-1980 which describes and shows pics of many of their boats, including their status as of the publishing date so was thinking i might be able to find something on yours listed. Most listed in the book are 30-40 feet or so. Thanks. Anything would be appreciated, Webbers Cove is of course still in business and even they don't know anything about the motor whale boat. 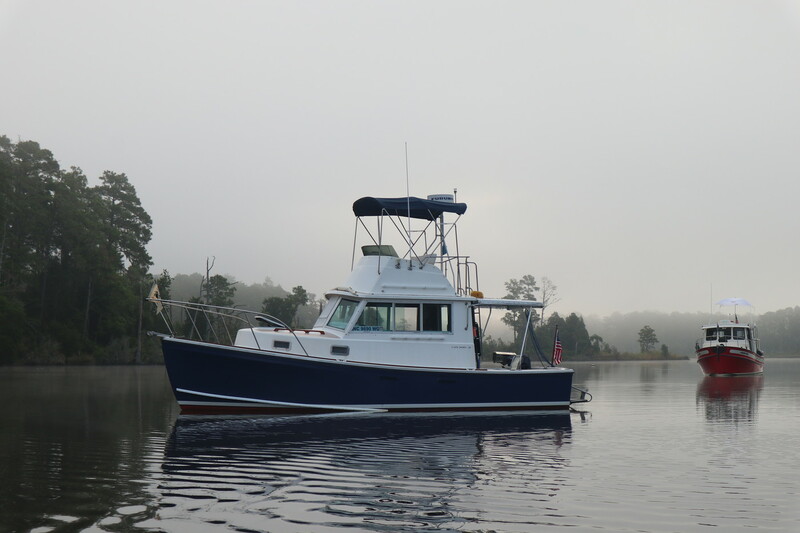 It's fairly easy to find the 34' utility boat as many were used as lobster boats up here, in fact a Webbers cove 34 hull was the first production fiberglass lobster boat. Got it, the 34 hull. I will see if anything is in the book. I see lots of the 34's advertised as lobster boats and old cruisers - great hulls. Nothing in my book on a 34. The book is Harbor Patrol Fleet. Maybe yours was used for something else. I dont mean to hijack this thread so maybe you could start a thread with pictures on this site or DEBF describing your boat and the projects you have going . It would certainly be interesting. I could then share with you some of the features of the 30 footer I had. We just finished our major over winter boat project, fixing crazing and blemishes in our cockpit and decks. Filled and faired cracks and flaws, then barrier coated, primed it then finished with Awlgrip topcoat. We put polymeric non skid on and it came out great. Starting on interior wood soon. Looks very nice, I'm going to look into that as I have a deck to do when it warms up. How easy to clean would that be on a fishing boat?